The Michelin Tweel: the future of tyres is UGLY! 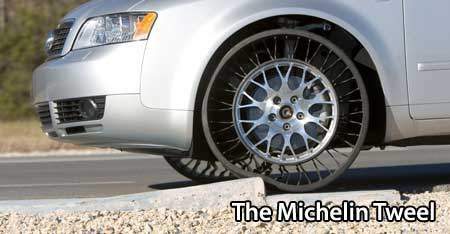 Home » International News » The Michelin Tweel: the future of tyres is UGLY! Michelin invented the radial tyre fifty years ago. The first tubeless tyre was invented 100 years ago. Now the tyre has been reinvented again. The next step in tyre technology has been unveiled. 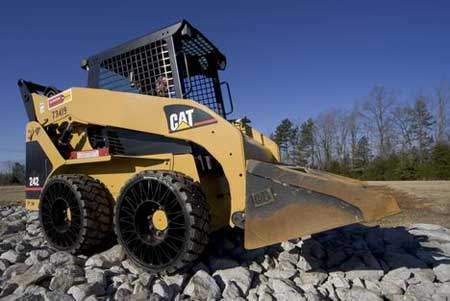 The Tweel is a simple looking hub and spoke design which eliminates the need for air pressure. 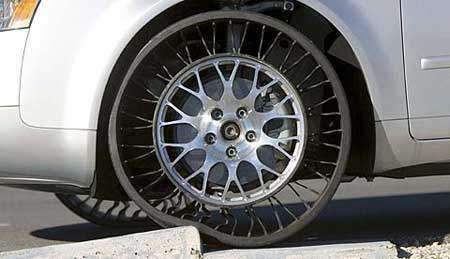 Flexible spokes are fused with a flexible wheel which deforms to absorb shock. 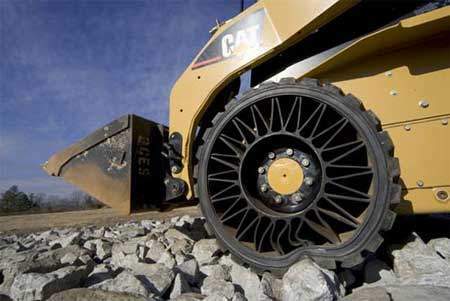 The Tweel also has a unique capability to have different vertical and lateral stiffness. Vertical stiffness affects ride comfort, and lateral stiffness affects handling and cornering. The ability to tune these two parameters differently allows the best of both worlds, ride comfort and superb handling! It sounds good and works well, but I have to say it looks pretty ugly. Perhaps Michelin could find some way to eliminate those gaping see-through holes for the final production model. Maybe with a covered sidewall. I think the wheel is currently ‘naked’ to demonstrate how the inner spokes bend across surfaces. 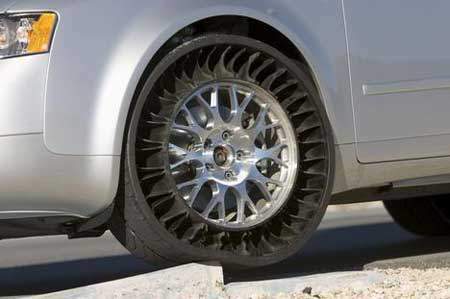 The Tweel is not only for cars. Bulldozers can use them too. Works well over rocky terrains like this, so it should work well for 4WDs too. You can see how the outer thread and the spokes bend to go over the uneven surface. 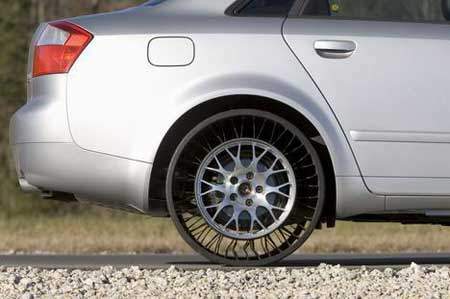 The Tweel on an Audi. Because of the spokes I think we can say goodbye to the large sports rims with low profile tyres look. The Tweel seems to use a small hub with large spokes. 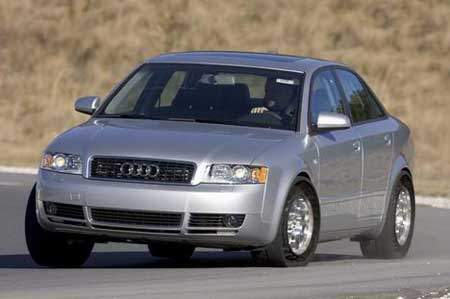 An Audi A4 on the track running on Tweels. Michelin has increased lateral stiffness over normal air-pressure tyres by a factor of FIVE, giving the car unbelievable handling properties. How far are we from mass-production and how much will it cost? Michelin says radial tyres will be the standard for a long long time to come, but research gained from the Tweel is helping it develop reinvent the way future vehicles move. Things like checking tyre pressure, fixing flat tyres, and balancing between traction and comfort could all fade into memory.